I recently saw a post which concerned itself with whether it was faster to paint the larger scale or the smaller scale. The answers revealed a variety of factors, suggesting the matter was not so straight forward. 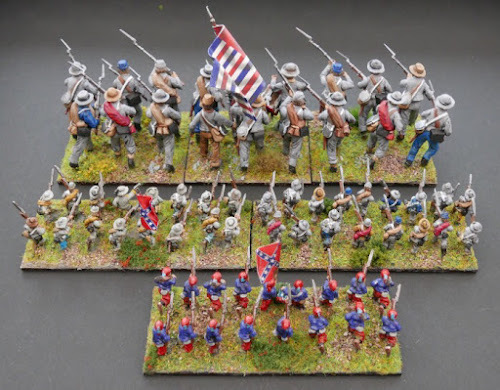 Having recently been painting 28mm ACW, for the post, I threw together a similar unit in 12mm to compare the differences in prep, painting and basing times. This post demonstrates some of those differences. Last year I painted up Confederate and Union forces from the Kallistra 12mm range. They were based on the supplied 40mm wide by 20mm deep bases. By the end of that project, I was slightly dissatisfied by the result, feeling that the bases needed to be a bit deeper to better define to lines and two small bases side by side felt a bit of a weedy way to show a regiment. Consequently, I am presently trialing a rebase, so that two old units (16 figures) would now go on a single big base (I am in a big base mood), 80mm wide by 30mm deep. The efficiency of the bigger base means that an extra 1 or 2 figures (9 in a rank) can be used and the slightly deeper base means that the two ranks squeezed together in an unnatural way on the old bases now have a bit more room to breathe. The new bases actually look better to my eyes and are easier to manage, though obviously cannot model march column for road movement in an aesthetically pleasing way and some may like to see the figures packed a little tighter than my examples. 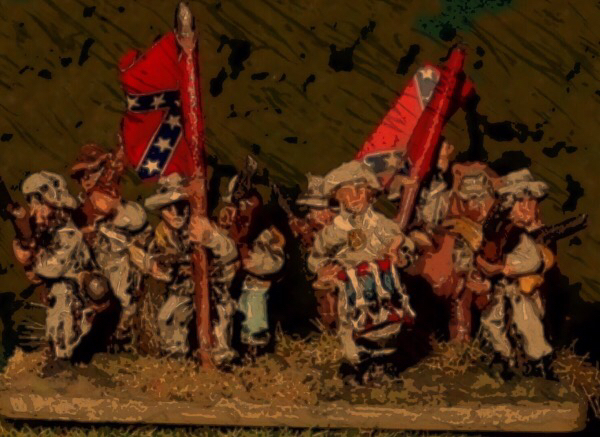 Revisiting this 12mm army gave me an excuse to open my last remaining Confederate blister pack and paint up a unit so that I could time each phase of unit construction to get a 'time taken' per figure from prep to basing, as I did in my last post for the 28mm scale (link below in Resource section). The 28's have three bases (50mm frontage) per unit, with bases organised into two ranks of three, needing 18 figures. The five stages of construction (described in the diagram below) took 13 hours and 25 minutes for the first 28mm unit to be completed, with each figure therefore taking around 45 minutes in total to complete. The first obvious thing to observe is that on a like for like basis, the smaller scale will be cheaper to buy and paint up faster, however if one is seeking the 'massed look' from the small scale or more units are wanted in the same table space, then a greater head count needs to be bought into play, for more cost and painting time. It is fair to say that over the same gaming space that the 28mm unit occupies (150mm frontage by 40mm deep), two 12mm units (on 80mm frontages) can be deployed side by side and arguably a third unit to the rear for a total depth of just 60mm. So my 4' X 3' table might take six to eight 28mm regiments, but the same space could easily handle twelve to say twenty 12mm units, especially in a hexed environment, where hexes are 100mm across, nicely taking a full unit per hex cell. The shot below demonstrates one 28mm unit and two (plus a third) 12mm units, the total foot print of the two units is relatively close to the 28mm unit and the third doesn't really break anything if shoved forward into contact. The cost of material and then the cost of painting time for the smaller scale is cheaper / faster on a one for one basis and even thought the costs and painting time rise for the massed look (i.e. 2 - 3 times more figures), it still comes in at under the cost and time of painting 28mm even in plastic. Stage 1 plastics need glueing together, which considerably adds to the 28mm prep time. The final numbers are that on a 1 for 1 basis, a 28mm plastic figure from start to finish takes me 45 minutes. A 12mm figure takes 10 minutes (note this base has 17 rather than 18 figures). On a 2:1 basis that would equate to two 12mm figures taking 20 minutes and even three figures for a 3:1 ratio would only take 30 minutes and still have a speed advantage over the 45 minutes for each 28mm figure. Creating three 10mm units would be taking me close to 10 hours, at which point I think that it becomes more a question of personal preference of scale and the storage capability of terrain rather than the cost and construction time of armies. Stage 3 (block painting) has some obvious opportunities in the small scale for shortcuts as some things like gun barrel, hands, face and hair are a single stroke and other things such as socks and buttons can be ignored altogether. Though in some other stages there is surprising parity in the painting times needed. Of course at the end of the entire process, one has to ask the question which scale you actually prefer (or need) to see on the table and the more games you play, the painting times becomes less relevant. Note, when doing the 28's I airbrushed all the Stage 2 processes, while for the 12mm, each part of the stage was done by hand, but taking set-up and clean up times of an air brush into account, any advantage of one over the other was largely negated. In conclusion a 1:1 change downwards in scale has cost, painting and basing benefits that some may feel persuasive for their own situations, but as head count increases, it becomes more a question of preferred aesthetic and I would submit that any small advantages in unit preparation time when painting in mass has to be weighed off against what scale the gamer would prefer to see on the table over the coming years. I actually find it hard to choose between the two and that is stressing my storage space somewhat at the moment. My like of hexes would push me to the smaller scale rather than any other consideration and the aesthetic of the larger scale would push me the other way. Hi Ross, yes, I have a couple comments on the various forums that I post that show that matters are not so straight forward. one reader would never block paint a 28mm, so by default the extra attention they get, distorts the comparison that I make and at the other end of the spectrum, another reader feels that small figures can take longer to paint, tidy up and base.